We are pleased to offer for sale this Presentation Case for Coins by Lighthouse MAHOGANY High-Gloss for 20 Quadrums (PIANO). This Presentation Case has space for 20 Quadrum coin holders. 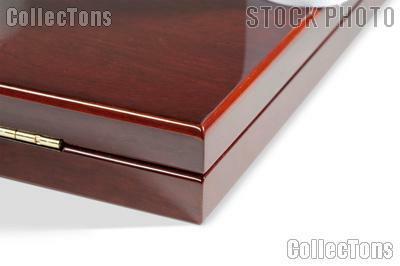 The Presentation Case has a high-gloss varnished mahogany finish. Each Presentation Case is superbly crafted and features a magnetic closure system. The Presentation Case features a padded inside lid lined with black satin. The coin capsules fit into a molded tray lined with black velour. This Presentation Case is new from our inventory and measures 12" x 9 5/8" x 1 1/14". This Presentation Case is designed to work with Lighthouse Quadrum Coin Capsules.